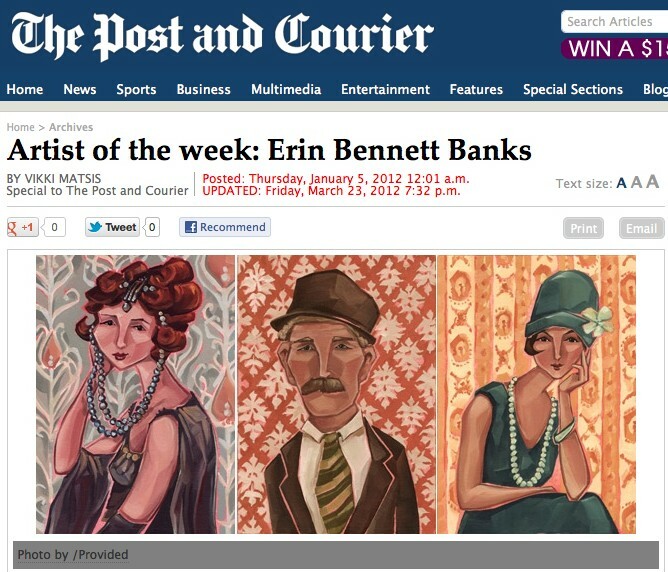 Inspired by the angular form of oil painter Modigliani and the soaking colors of Maxfield Parrish, Erin Bennett Banks is a nationally published illustrator who enjoys working with flat brushes and oils. As a result, her work is inclined to patterns, time-period pieces and multicultural inspiration. Since graduating from the Savannah College of Art and Design with her MFA in illustration, Banks has worked for the Harvard Business Review, The Weekly Reader, McGraw-Hill, Highlights for Children, Bed Bath & Beyond and JCPenney. Banks has works displayed at Verbena Salon and is preparing for the group show “Tiny Illustrations” at Rick Rhodes Photography & Imaging, 1842 Belgrade Ave. in West Ashley. The opening reception will be 6-10 p.m. Friday and also will feature work by Tim Banks, Baird Hoffmire, Farrah Hoffmire and Ben Timpson, with poetry by Marcus Amaker and music by 54 Bicycles. If I knew then what I know now: I would recognize that time is the most valuable commodity. I’m daydreaming about: Decluttering my life — that’s a running theme! My inspiration comes from: Japanese prints, old art nouveau photos, vintage wallpaper patterns, African quilts. I am most grateful for: My artist husband (Tim), baby girl (Ava Rose) and our two pugs (Fiona and Grace). My worst fear is: The rat race. If I could ask the president one thing, it would be: Could we be more like Denmark? First thing I do in the morning: Look enviously at our sleeping pugs. Best mistake I ever made: Moving South with no strings attached. Herbivore or carnivore? : A die-hard herbivore. My family says I am: Focused. Price range of artwork: $150-$1,000. My goal for this year is: Build a larger collection of gallery pieces, since most of my prior artwork has been geared towards illustration. And possibly try water-soluble oils, since I worry about toxic fumes. What the world needs is: More thoughtfulness. Meet me at: Waterfront Park, on one of the benches in the middle where you can sit inconspicuously and people-watch.